The taste of early spring is just like the taste of sansai (mountain vegetables): succulent, fresh and tender. Appearing in late March and early April, sansai include the tender buds and shoots of plants found in the wild, some of which grow to be too tough and inedible when fully grown. Although some of these are now cultivated, they used to be gathered wild in the mountains. Sansai often appear on early spring menus and can be simmered in dashi, fried as tempura, or cooked into rice. Sansai soba is a popular dish featuring soba (buckwheat noodles) topped with a medley of simmered sansai vegetables and hot broth. 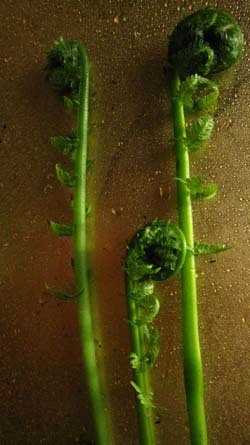 My parents love to gather the tender shoots of common ferns when they take walks in the forests during spring vacations. In fact, it's hard to keep them from gatheirng too many! But I love watching them, happy and excited as children, hunting for the smallest and most tender of the shoots. They usually manage to gather enough to fill a small bag. Upon returning home, they wash the shoots, removing the outer fuzzy growth, and then soak them in water with a bit of ash from a wood fire for about 20 minutes. This is said to remove bitterness. Then they simmer them in dashi, soy sauce, a bit of sugar and sake for about 10 minutes. The cooked ferns have a pleasantly soft, yet slightly springy and slippery texture that reminds me of a sea vegetable. They keep for several weeks when stored in a jar in the refrigerator. Although we have ferns growing in our garden, I feel much better letting them grow, and instead buy my fiddlehead ferns in the store, where they have thankfully appeared in recent years. 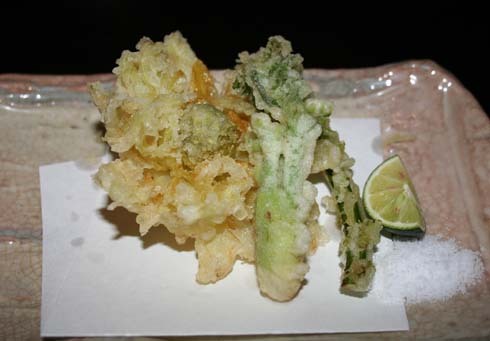 Above: Sansai tempura. 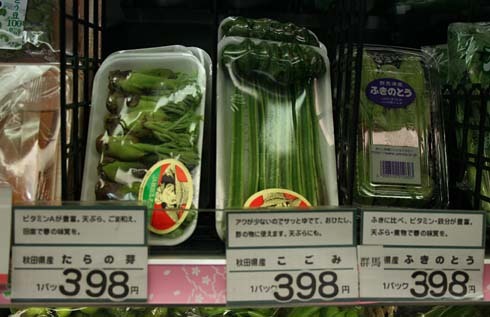 Below: Sansai at the grocer, from left to right: tara no me (the shoots of the tara plant); kogomi (fiddlehead ferns); fukinotou (shoots of the fuki plant). Fern shoots gathered from our own garden. We prefer to let them grow.